Welcome to Victoria Park Villas! This 4700 square feet semi-detached house takes on a soothing cream and ivory palette as its base colour. The neutral tones together with the intentional straight lines designed to frame the various spaces evokes a sense of formality at a glance. 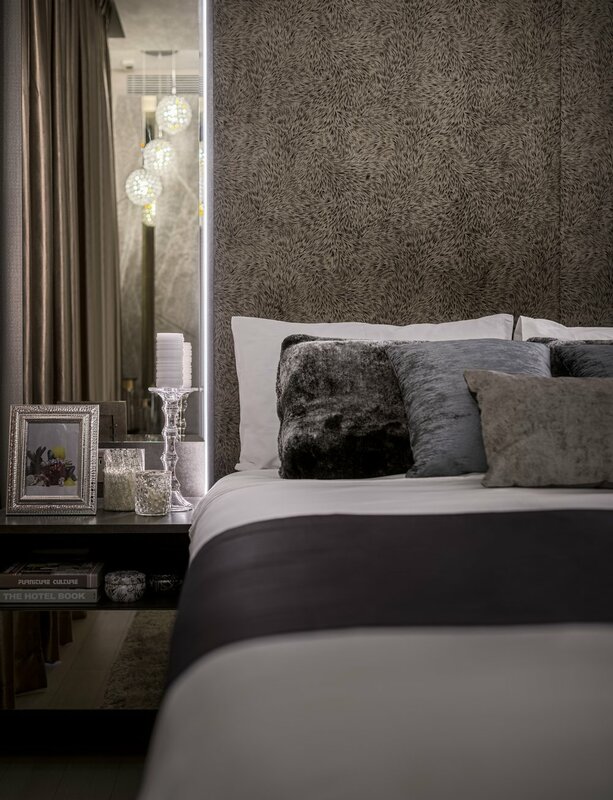 A closer look reveals a myriad of details featuring complementary textures and finishes exuding an ambiance of refined elegance to encompass the entire first storey. The TV sits on the slab-matched travertine clad wall and console which is matched with the stainless steel strips overlaid on the ivory coloured wall cladding. Special attention was given to the area surrounding the lift too, using the same stainless steel strips and wall cladding to follow through the walls around the living space. 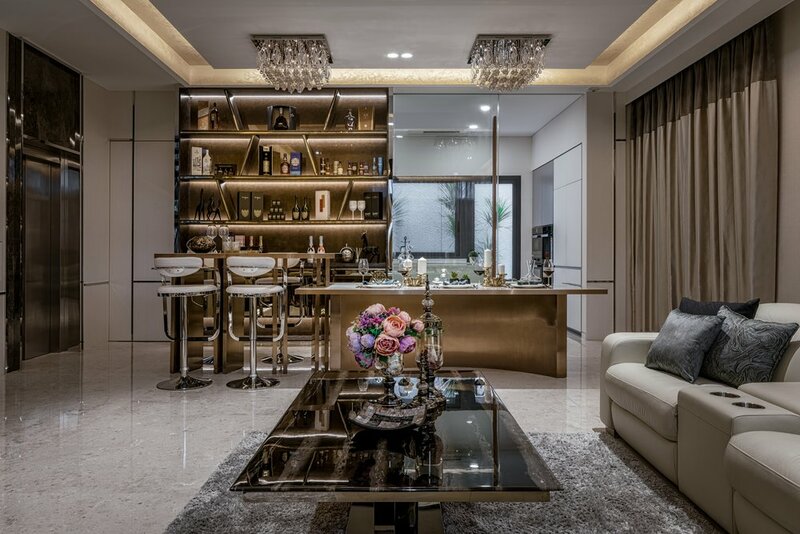 Over at the dining area, the fully customised integrated bar and dining table takes center-stage. The curved stainless steel base is infused with titanium with a rose gold coloured finish, featuring an ultra-compact quartz surface which is not only stain resistant but wards off scratches too! An inviting lobby awaits as walks into the basement from the car porch. 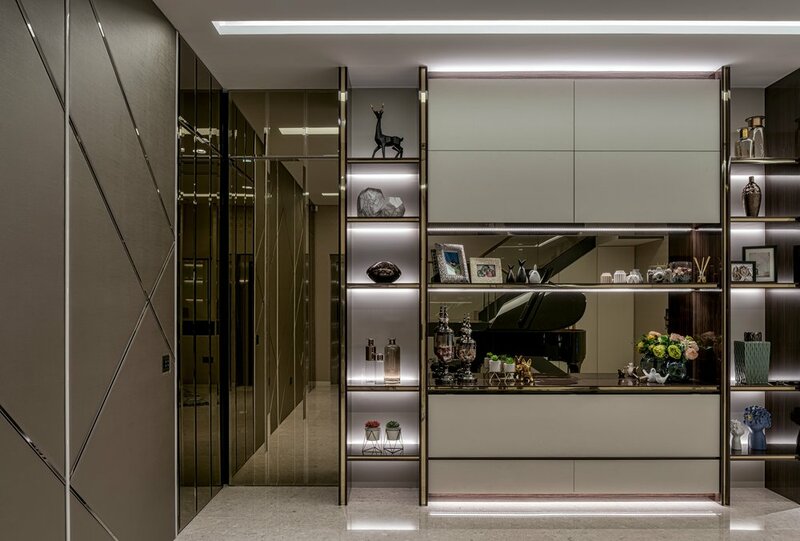 A baby grand piano takes immediate attention of guests walking into the house as the subtle details along the walls takes over to reveal the meticulous thoughts behind the design intent. To the unsuspecting, rooms are hidden beneath the mirror clad walls which are actually doors to the various rooms.